Killer Characters: Good Fortunes to you! From A KILLER READ by Erika Chase, coming this April. Okay, so we’re in 2012 now and one week down. I know it’s not too late to talk about New Year’s resolutions but like most people I know, if I make them, I break them. So, I’ll just pass on that. And, it’s really hard to talk about all my friends in the Ashton Corners Mystery Readers and Cheese Straws Society without giving away too much of the story. You won’t be able to read that until April this year. Unless, of course, you sneak on over to Erika’s website and read the first chapter which is posted there. I truly do hope all your New Year’s resolutions and fortunes do come true. What are some of them? Fortunes from fortune cookies are like little tiny mysteries. Who can resist? Once in awhile I save them as well. When they feel really appropriate to what I am experiencing or when it is meaningful enough to be inspiring. I do like reading the fortunes...sometimes it fits the persons perfectly. I agree about fortunes -- it's fun to figure out how they apply, and sometimes a bit mysterious. I like to save the fun fortunes...and gobble the cookies. I've been getting duds lately. I'd like to get some of these fortunes in my cookies. It sounds as if exciting things are coming your way, Lizzie! 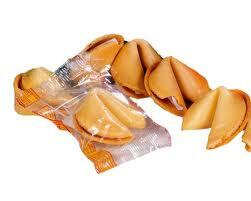 Now I'm in the mood for Chinese food and fortune cookies. I'm going to hop on over to Erica Chase's website to read the first chapter of "A Killer Read". It looks good, too! Thanks, Nancy. Better have some cookies close at hand.